KidsPsych features interactive games and activities that are designed to help young children master specific developmental skills. The games are divided into groups for younger (age 1-5) and older (age 6-9) kids. Each activity has information for parents about the skills it helps to foster. Bright and colorful, with lots of cheerful sound bytes, this site will keep your children's interest high. 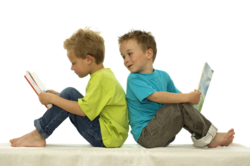 The site is well organized for young children, but non-readers will definitely need help. Each activity is linked back to the index for both age levels and to About This Activity (for parents). Two cute little creatures named Oochi and Oochina host the site. Oochi is the guide in the age 1-5 activity area, and Oochina hosts the age 6-9 activities. Each activity requires the user to help these little creatures accomplish a task. The activities for younger kids in Oochi's area include activities such as putting the right cube into a set of steps for Oochi to climb down safely or helping him find a hammer in the tool box to hang a picture with. The user is given encouragement to find the best way to help Oochi. Oochina's activities are a little more complicated and include some higher-level problem solving skills. One of my favorites is the Rotating Faces game that has four faces, with different expressions, cut up and rearranged. The user has to try to find the whole pictures of the individuals and put them together. In the meantime a number of unusual combinations are explored. This is a great site for parents and children to use together.